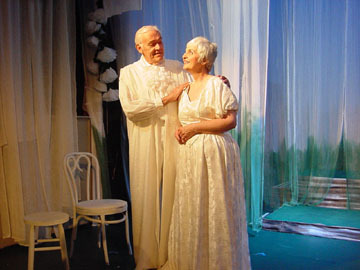 We have all kinds of Cheesecloth for all your needs. What is the widest width available? 36" Wide - If you need wider you will need to make your own arrangements to sew/stick material together. I currently have cheesecloth that I am using. How do I figure out which type it is? Take a piece of your existing cheesecloth and match as closely as possible to the pictures provided above. Get the number of strings per square inch by taking a piece of your existing cheesecloth and get a measuring stick. Place the measuring stick horizontally on top of the existing cheesecloth and count the number of strings within one inch. Now turn the measuring stick vertically and count the number of strings within one inch. The two numbers you just counted should put you close to one of the weave count numbers (20x12, 20x16, 24x20, 28x24, 32x28, 40x32, 44x36) provided next to the photos above. Can I get cheesecloth packaged differently? Yes. You can special order cheesecloth on rolls, single-ply and with the length needed. 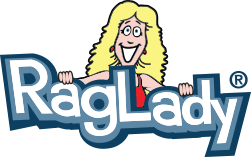 (Minimum order 1,000 yards -this could all be on one roll or up to 10+ rolls - 100 yards/roll up to 10,000 yards/roll) Each roll on a 2" or 3" core (tube in middle of cheesecloth roll). Bleached or unbleached (natural). All special orders are FINAL SALE only. Please call my toll free number 866-724-7787. BLEACHED Cheesecloth is used extensively in the Food Service Industry for basting, straining and filtering during food preparation processes. Bleached Cheesecloth has been processed to remove the impurities of natural cotton fibers such as seed particles and oils. Bleached Cheesecloth is processed to meet the medical grade specification for non-sterile gauze products. Bleached Cheesecloth is NOT a CHLORINE BLEACH. Non-Chlorine Bleach does NOT contain chemical binders. UNBLEACHED Cheesecloth is generally not used in food preparation as it is in natural cotton state and has not been Bleached to remove the impurities. Too many cotton seeds and "pepper trash" in the material for use around food. Claudia Lucero of Urban Cheesecraft moved to Portland, Oregon in search of a life that emphasized quality over quantity. She started pickling vegetables using a practice known as lacto-fermentation — acquiring produce from her local CSA and dairy whey in liquid form to preserve her shares. She soon realized that the dairy whey was, in actuality, a byproduct of making cheese. Hey guys, You asked for pictures. 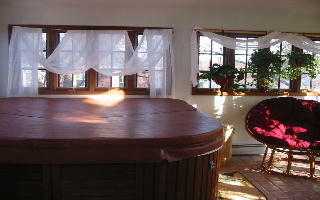 I'm really happy with how my hot-tub room turned out. 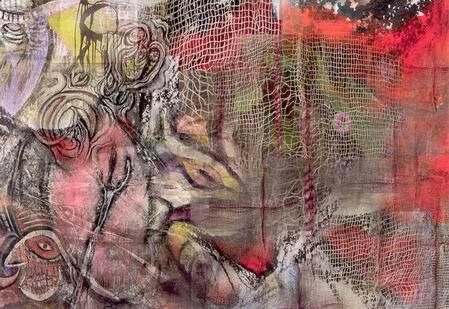 I was going for a tropical mosquito-netting type of effect. No curtains were really working. Cheesecloth really turned out to be the answer! I think it looks great, plus I was able to return $200 dollars worth of curtains (that didn't really achieve the look I wanted) and replace them with about $30 worth of cheesecloth. I'm really thrilled I found you guys on the web. 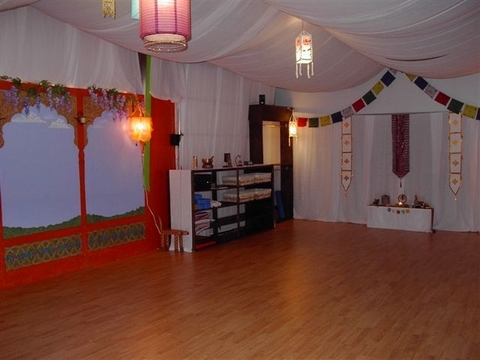 Hello, As promised, we are sending you photos of our yoga studio, decorated with a generous supply of the cheese cloth we bought from you. We used the cheese cloth on the ceiling, the end wall to hide an ugly steel door and down the garage door to hide that too. On top of the shelving and on our alter. It's everywhere! Cut two cheesecloth panels for each section of your umbrella. We cut sixteen 3-yard-long panels for our octagonal umbrella. Measure the distance between the umbrella spines. For each side, cut a length of twill tape 2' longer. We cut eight 74"-long strips of tape. Overlap two lengths of cheesecloth in the middle to make a panel wide enough to fit the space between the spines. At the top, fold the raw edge of the overlapped panel over 1/2" and zigzag to a length of twill tape, leaving a foot of tape loose at each end. Tie a knot in each loose end of tape to prevent unraveling. Repeat for each section of the umbrella. To make the rosettes, cut eight 10" x 44" pieces of striped fabric. Fold each piece in half lengthwise, with right side out. Sew sides together by running a gathering stitch along the long raw edges. Pull up the thread to form a rosette circle from each strip. Stuff with polyester fiberfill. Cover the buttons with striped fabric, following manufacturer's instructions. Cut eight 10" pieces of stem wire. Insert a piece of wire into each button shank. Bend wire in half and twist together to secure. Insert button through the hole in the rosette with wires going through rosette. Apply hot glue to backside of button to hold it in place. Repeat for remaining rosettes. Measure diameter of pole and add 2". For the pole cover, cut two strips that are each 6" wide by 2 yards long, from striped fabric. Fold each strip in half lengthwise, with right sides facing. Join edges and run a gathering stitch 1" from the raw edge. Gathering allows the fabric to grip the pole, preventing it from sliding off. Check that the tube will fit on the pole. Loosely pull up gathering stitches. Secure thread. Trim excess fabric. Turn right side out. Repeat to make second tube. 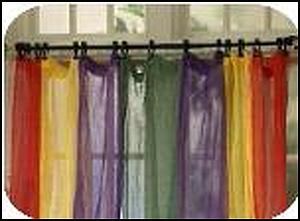 Replace your traditional window treatments with bright, fun and festive cheesecloth curtains. 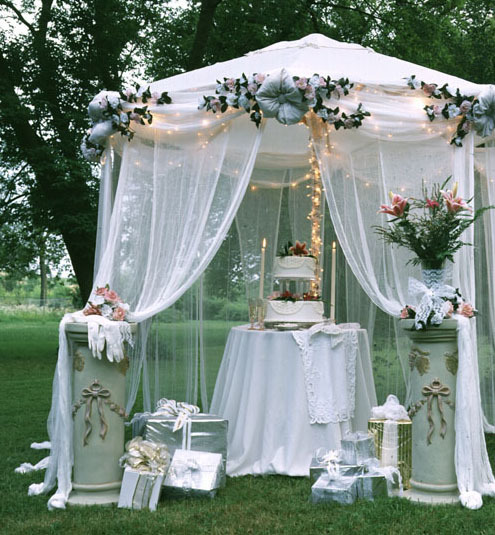 These no-sew, inexpensive curtains could be the perfect addition for your next party. 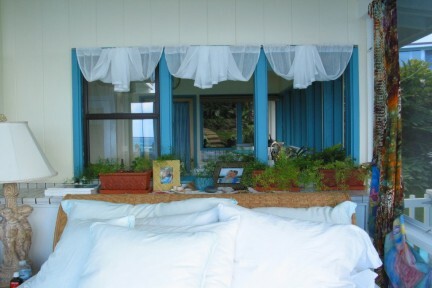 Dye inexpensive cheesecloth bright colors for an instant no-sew window treatment. Mount curtain rods according to instructions. 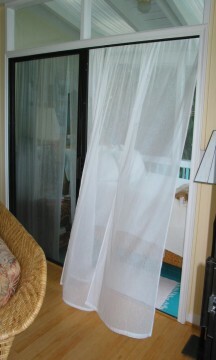 You can mount these at the top of the window or lower to create cafe curtains. Cut cheesecloth into strips to desired length. Note: Cindy Piccoli cut them longer than the window to allow them to "puddle" at the bottom. Dye the cheesecloth strips according to the cold water dye package directions. Clip on cafe curtain hooks to the cheesecloth. String curtains along rod and hang. 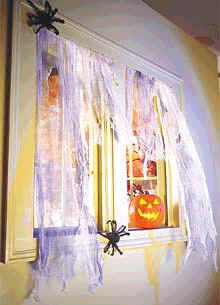 Dress up your haunted house with these ragged, ghostly curtains that are sure to make any room creepier. It's scary how fun and easy they are to make! Make strong tea (4-6 tea bags in 4 cups water). Allow cheesecloth to dry completely. Lay cloth flat and use scissors to make random cuts in fabric to give a ragged look. Use black spray paint to make random dirty spots on fabric. Spray outside to prevent overspray. Allow to dry. 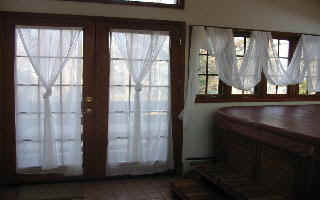 Hang one piece of cheesecloth on each side of the window and drape the remaining piece across the top. Tape to curtain rod. Horrorfind Weekend Convention 2nd Place Winner! Hot glue the styro ball to the styro cone to form a head & body. To create arms: bend 1 piece of 18” wire in half. Leave a small loop at the end. This loop will be the hand. Poke the ends of the wire into the styro cone where the arm should be. Repeat step for the other arm. Wrap the arms with white fabric or plastic wrap. Cut the cheese cloth into 3 (1yd.) pieces. Pour fabric stiffener into a large bowl or bucket. Soak one piece of cheese cloth. Squeeze out excess. 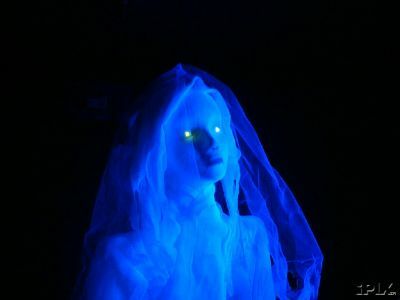 Carefully drape the cheesecloth over the head and body of the ghost. For best results drape the cloth at a diagonal angle. Repeat steps 5 & 6 until all of the cheese cloth has been used. Give the ghost a breezy feel by stretching the ends of the cheese cloth. Use some bottles, cans or candles to curl the ends of the cloth upward and downward. Let this sit overnight. 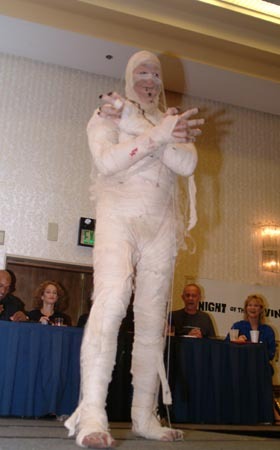 Once completely dry, the styro body and arms can be removed. The styrofoam body can also be left in the ghost to give a little extra support. Decorate the ghost with: raffia, ribbon, flowers, wiggle eyes, glow in the dark accents, etc. This ghost also looks great undecorated. Cut cheesecloth to desired size (depending upon the size figure you want to make). Pour LINIT® Starch into clean basin or bowl. Immerse cheesecloth in starch and let soak for a few minutes. If using spray stiffener, spray heavily and let sit for a few minutes. Remove cheesecloth from starch, let excess starch drain back into bowl. Place ball on top of paper towel roll for the head. 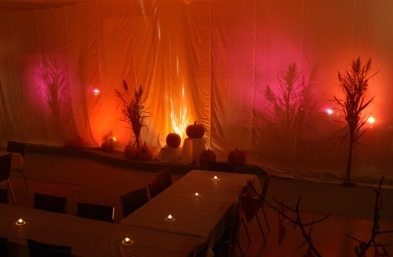 Drape the cheesecloth over the form and arrange. 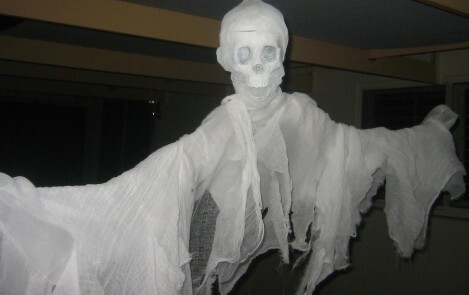 Use straws to make arms for a ghost - or wings for an angel. Let dry. (May take overnight to dry completely). Remove straws and paper towel roll and the form will stand on its own. 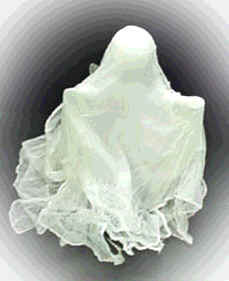 If you are making a ghost, glue decorations onto the white cheesecloth. If you are making an angel, you might want to spray the form gold before decorating.